If you are looking for a great series of books on a wide variety of topics that boys like try the Pocket Genius: Facts at your Fingertips Series published by DK. We are big DK fans. These books are great. They are small in size but big on information and super take-along books to bring with you on trips, shopping, to appointments and more. 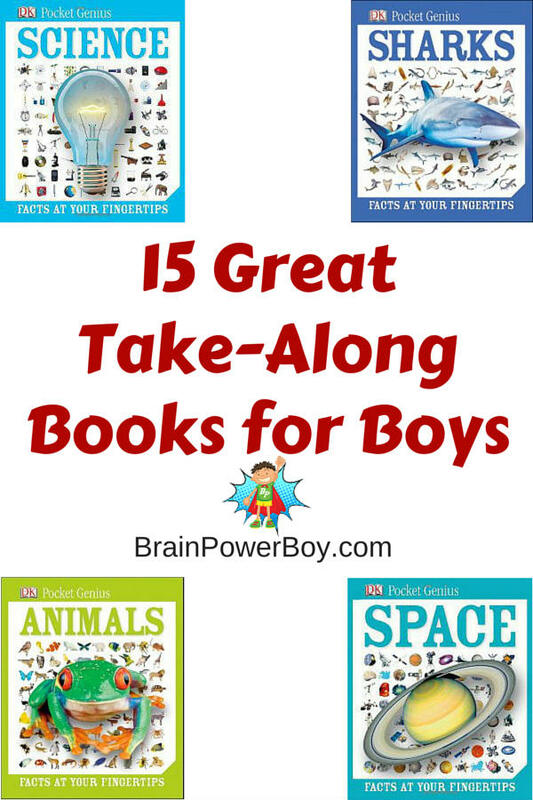 I hope you will take the time to check out this best books for boys series. Every once in a while I find a series that really appeals to boys. I tried these books with my boys book club and they enjoyed them–big time. If your boy likes things such as the largest, smallest, oldest, longest, deadliest . . ., you have to check them out. This post may contain affiliate links which means I may receive a small commission, at no cost to you, if you make a purchase through a link. All opinions are my own and I never share things unless I think they are great for boys. The new DK Pocket Genius series is full of small, hard-cover books that pack a big punch. I ran across these books a bit ago and was impressed at the amount of information they stuffed into these little books. Each book in the series is of high quality which is no surprise as DK is one top-notch publisher. The Pocket Genius books are filled with facts and each book includes a nice glossary. Most are just over 150 pages. There are currently 12 books in the series (though we can hope for more) and each stands on its own. Pocket Genius Mammals: almost 200 mammals such as dugongs, pangolins, solenodons, ungulates, and moonrats, as well as the regular favorites. Pocket Genius Earth: plenty of info on the land, ocean, atmosphere and climate. Pocket Genius Science: Covers matter and materials, energy and forces, and the living world. Pocket Genius Human Body: This has everything! Body, bones, blood, lungs, digestion, brain etc. Pocket Genius Animals: What animals eat and what eats them and many more facts. Pocket Genius Rocks and Minerals: Identify rocks and minerals. Pocket Genius Ancient Egypt: Dive into the daily life, religion, and tombs of Ancient Egypt. Pocket Genius Horses: The different horse families are covered as well as ponies, light and heavy horses. Pocket Genius Space: Covers all the planets plus constellations, comets, galaxies, and rockets and spacecraft as well. Update: There are a few more titles out now. Inventions and Technology, Ancient Rome, and Dogs were added to the list. Click here to see them all . The pictures are wonderfully detailed and clear. The facts are bite-sized and there are a lot of them. The books include statistics, top-ten lists, facts, record-breakers, timelines and more. Did you know there is a dolphin that can swim 35 mph or that 50,000 skin flakes drop off a human’s skin surface every minute! (I really could have done without knowing about all of those skin flakes). Pocket Genius’ small size makes them great as a take- along book. Stick Bugs in a backpack to take along on a hike or grab the Human Body book on a trip to the doctor. Encyclopedias are great to have on hand for those questions that you just know are going to come up. Boys who love facts will thoroughly enjoy these books. Visual learners will enjoy the pictures and the layouts and boys who love nature will find plenty of choices here.